This week we are going to have a really short and easy test to check that you fully understand how to make Conditional questions using type 1 , 2 or 3 . In additon , we would like to find out your capability to interact or respond to unexpected questions . The teacher or teachers are going to ask you some questions using different types of conditional questions , and you have to answer to these questions using the right verbal tenses and providing a logical answer . Don't get panic .It is going to be a really short control . A minute or so . 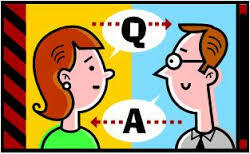 Here you've got some links with some questions similar to the questions you might be asked in the speaking test .